New research fields are developing on the foundations of well understood related areas. It is just like in case-based reasoning: Old experiences are reused for new problems. This has the advantage of solid starting points, but the disadvantage of dwelling on old ideas. Some of the adopted ideas need to be replaced by new ones as time goes on (consider the development of modern cars starting with a motor driven stagecoach). It is necessary to reconsider critically the ongoing development from time to time. It is the aim of this chapter to reconsider and to extend some basic ideas of CBR. This may also help to clarify the special benefits of CBR. 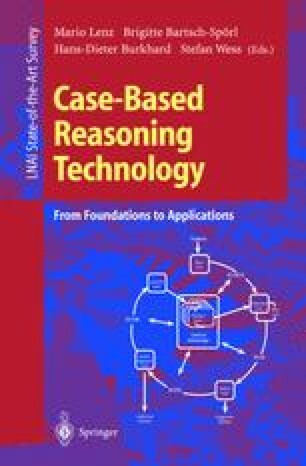 The investigations in this chapter can be considered as a theoretical foundation for the Case Retrieval Nets (CRN), which are discussed in Chapter 3. CBR was developed in the context and in the neighborhood of problem solving methods (especially rule-based and model-based inferences), learning methods (Machine Learning, Statistics, Neural Networks), and retrieval methods (Data Bases, Information Retrieval). It has inherited the separation from “problem” and “solution” in the cases, and a notion of “similarity” based on distances. Machine Learning, Statistics, and Neural Networks all look for the common aspects of the investigated examples (recently under the headline “Data Mining”). CBR can cover the orthogonal problems of the extensional cases (the knowledge of experts which goes behind the standard solutions of text books).